Today I am sharing some more of my living room decorated for the holidays. Yesterday I showed you the vintage brass sleigh and reindeer from The Longacre Flea on Etsy. I filled it with a few candy canes. The white ginger jar is from One Kings Lane. I have a string of white lights inside and I love the effect. But let me begin with some daytime pictures first. I have not moved furniture around or drastically changed the look of my living room decor for the season. I just incorporated the Christmas decor to fit in. This was largely due to lack of time but there was also no real need for it. It will also make putting everything away easier after the festivities are over. This snowman trio was a gift from about 15 years ago. It comes out every year. I love this brass elephant paperweight from Tatter and Fray. This silver tray was a Salvation Army thrift store find along with the capiz shell bowl and the glass candy container which holds M&Ms through the year. The vintage caroler trio, shared yesterday, is from Milk & Hannah and the ornate brass trivet is also from Tatter and Fray. I have a flameless candle on it. There is something about snowmen! My kids decorated the balsam Christmas tree purchased from a local Stew Leonard's. I think they did a great job. They did not use everything I decorate the tree with each year but they did use most of the ornaments. They even strung the lights themselves. That is the most tasking part of decorating a tree but so well worth it. Another close-up picture of the ginger jar aglow. To see more of my mantle click here to read my post from this past Monday. And that is some of my holiday decor this year. I hope you enjoyed the eclectic mix. Thank you for visiting even if you are unable to leave a comment at this time. I shall fix this soon. If you would like to you could email me at Lisa.Rozario@gmail.com. 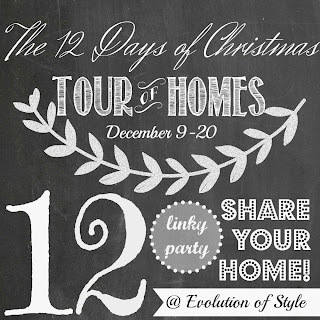 Linking up to this holiday gathering at Evolution of Style.